**New for 2016. LG Electronic’s OLED55B6P 55-inch Flat 4K OLED TV is LG’s highly rated 55-inch 4K Ultra HD TV. 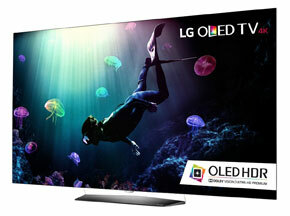 An OLED TV gives you many advantages over LCD and LED TVs. The black levels of OLED TVs are the best of all screen technologies. The viewing angles are fantastic, with no loss of contrast. Another advantage is speed, which is important when viewing fast moving action. 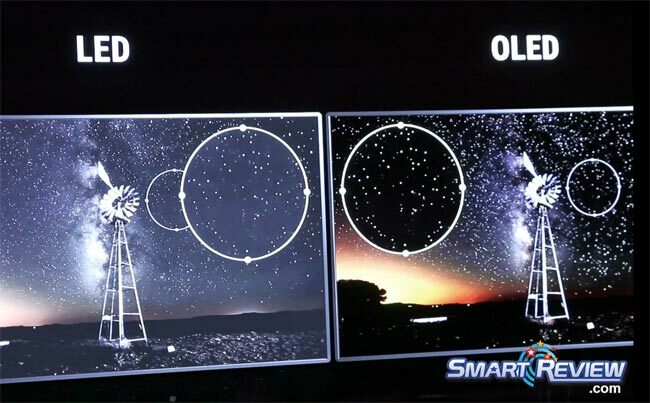 OLED is many times faster than LED and LCD displays (0.1 microseconds refresh). There are no backlights as each pixel is self illuminating. LG is the leader in OLED TVs. Not only is this an OLED TV, but also a 4K Ultra HD TV with over 8 million pixels of resolution. This is four times the resolution of Full HD, giving you a stunning sharp picture. Most TVs have a 3 color pixel. LG has added a fourth, a white sub-pixel to the conventional three colors (red, green and blue). This technology will enhance the color range and accuracy for more realistic colors. New for 2016, the LG OLED55B6P includes HDR technology with HDR10 & Dolby Vision. 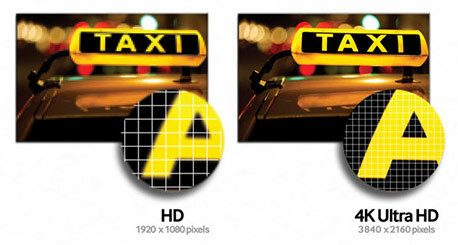 This technology will give you a brighter picture with colors that pop, and better dynamic range. This model also includes both an HEVC(H.265) and VP9 decoder for 4K streaming video from online providers such as Netflix and Amazon. Smart OLED TV with WebOS 3.0: For 2016 LG has revamped its Smart TV platform, using WebOS 3.0. The OLED55B6P is Internet Ready, and can play premium content from Netflix, Amazon, Amazon Prime, Hulu Plus, Youtube, Games, Full Web Browser, and more. LG’s new Magic Remote is included, which can take voice commands and act like a pointer, as well as traditional remote control functions. It is a universal remote as well. It has a built-in Wifi has Wi-Fi Direct. To speed up Smart TV operations, LG has upgraded the B6 OLED Series to include a Tru 4K Engine and a Quad Core Processor. The Clear Voice II feature automatically enhances and amplifies the sound of the human voice frequency range to help keep dialogue audible. Harmon Kardon sound with a 40 watt sound system provides sound with a Dolby® Digital Decoder. Built-in Miracast + MHL. The TV has 4 HDMI (2.0a) ports, and 3 USB (one is USB 3.0) ports. Smart-Review Commentary: In 2016, LG introduces its OLED55B6P Series 4K 55-inch OLED Smart TV. This is LG’s lowest cost 4K OLED 55-inch TVs for this model year. OLED screen technology is undeniably the best in the business, and LG has added a fourth white subpixel for even better colors. Deep blacks, wide viewing angles, colors that pop, and fast refresh rates are what define OLED TVs. The 4K OLED panel has four times the resolution of Full HD. New for 2016 is HDR technology with Dolby Vision. The new 4K blu-rays take advantage of this technology. We saw a technology demo of Dolby Vision, and were amazed at how much cleaner and brighter the picture was. Colors shimmer, and gives you a more natural looking picture. This is a Smart TV, so it is has Built-in WiFi, Miracast, Netflix & Amazon Ready, with the new WebOS 3.0 Smart TV Interface. The Smart TV features include a full web browser and a full array of APPs to access internet content, movies, sports, news and TV shows. Smart Share: allows you to display files from your tablet, smartphone, or PC by wireless WiFi on your big screen. 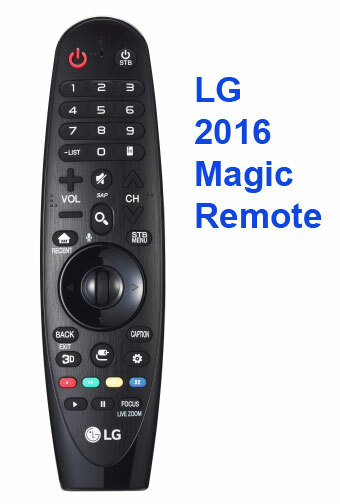 For 2016 LG now includes the new Magic Remote, which allows you to control your TV by voice command, or use the remote as a pointer. Use the Bluetooth® wireless audio streaming to speakers or headphones. This model weighs substantially less than a comparable LED TV. Owners have reported great picture quality. If you are looking for one of the best 55-inch TVs with the deepest blacks and best colors, 4K resolution, along with Smart TV functions and HDR, then the 55-inch OLED55B6P is a great choice. 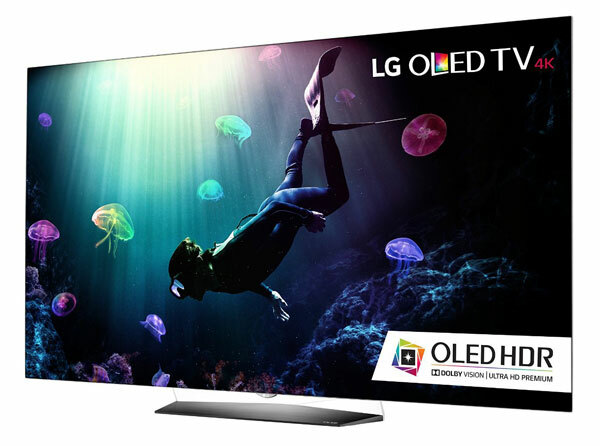 This OLED model has received one of the highest consumer reviews of any 55-inch 4K TV we cover. We previewed this model at CES 2016. It is not only a Smart-Review Top Pick, but has won our best of 2016 Award.